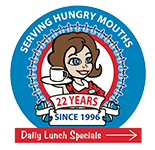 Daily Deals for Under $10 :: Dots Diner :: Big Portions, Big Taste, Big Value! It’s almost officially fall everyone! We may not be feeling those cool temps yet, but we’ve got Saints and Tiger football… and that makes me want to make a big pot of gumbo or some jambalaya and cheer on our Louisiana boys. You know, gumbo and jambalaya are not a regular items on my menu, but they are featured occasionally in my daily specials, along with some other really tasty home-cooked meals. If you’ve never tried one of my specials, I’ve got a calendar for each store posted on my website, where you can see what I’m serving. Prices range from $7.99 to $9.99, and a soft drink or coffee is included! You’ll leave full, and your wallet won’t be empty, either.